This is a list of my publication in English. New additions on April 5, 2016 are denoted with . You can read abstracts by a click. For latest papers, I include PDF files for downloading the whole paper. To see and print a PDF file on your computer, you first need to install Acrobat Reader. If you need a hard copy of my papers or further information about my publication, please contact me from my index page..
Kurosaki, T., Kaushalesh Lal, A.K. Mangal, Asit Banerji, and S.N. Mishra, "Entrepreneurship in Micro and Small Enterprises: Empirical Findings from a Baseline Study in Northeastern Areas of Delhi, India", CEI Working Paper Series No. 2015-07, October 2015. (Full paper in PDF, 629KB). Kurosaki, T. "Long-Term Education Statistics of Pakistan" (Japanese text with bilingual tables/figures), CEI WP, no.2015-06, August 2015. (Full paper in PDF, 1.2MB). Kurosaki, T. "Household-Level Recovery after Floods in a Tribal and Conflict-Ridden Society", CEI WP, no.2015-05, July 2015. (Full paper in PDF, 288KB). Hidayat Ullah Khan and Takashi Kurosaki "Targeting Performance of Community-based Development Interventions: An Econometric Analysis of a Women-Focused and Women-Managed Non-Governmental Organization in Rural Pakistan", February 2015. PRIMCED DP No. 64.(Abstract). (Full paper in PDF, 291KB). Alberto J. Iniguez-Montiel and Takashi Kurosaki "Limits to Economic Growth and the Effect of Redistribution in Mexico". February 2015, PRIMCED DP No. 63.(Abstract). (Full paper in PDF, 0.98MB). Takashi Kurosaki and Kazuya Wada, "Spatial Characteristics of Long-term Changes in Indian Agricultural Production: District-Level Analysis, 1965-2007", Jan 2015. CEI Discussion Paper, No.2014-10 / PRIMCED DP No.60. (Abstract). (Full paper in PDF, 2.01MB). Kazushi Takahashi, Abu Shonchoy, Seiro Ito, and Takashi Kurosaki, "How Does Contract Design Affect the Uptake of Microcredit among the Ultra-poor? Experimental Evidence from River Islands of Northern Bangladesh", IDE Discussion Paper No.483, November 2014.(Abstract). (Full paper in PDF, 995KB). Takashi Kurosaki and Hidayat Ullah Khan, "Impact of Human Resource Development Training on Crop Damages by Wild Animals in Developing Countries: Experimental Evidence from Rural Pakistan". August 2014, PRIMCED DP No.59. (Abstract). (Full paper in PDF, 312MB). Takashi Kurosaki and Hidayat Ullah Khan, "Community-Based Development and Aggregate Shocks in Developing Countries: The Experience of an NGO in Pakistan", March 2014. PRIMCED DP No.54.(Abstract). (Full paper in PDF, 484MB). Akifumi Ado and Takashi Kurosaki, "Motives for Sharing in Developing Countries: Experimental Evidence from Jakarta", PRIMCED DP No. 53, March 2014. (Abstract). (Full paper in PDF, 810KB). Abu Shonchoy and Takashi Kurosaki, "Impact of Seasonality-adjusted Flexible Microcredit on Repayment and Food Consumption: Experimental Evidence from Rural Bangladesh", IDE Discussion Paper No. 460, March 2014.(Abstract). (Full paper in PDF, 519KB). Takashi Kurosaki, "Long-term Agricultural Growth in India, Pakistan, and Bangladesh from 1901/02 to 2001/02", November 2013, PRIMCED DP No.46. (A short version of this paper has been published in International Journal of South Asian Studies.) (Abstract). (Full paper in PDF, 408KB). Takashi Kurosaki "Dynamics of Household Assets and Income Shocks in the Long-run Process of Economic Development: The Case of Rural Pakistan", April 2013, PRIMCED DP, no.39. (A short version of this paper has been published in Asian Development Review.) (Abstract). (Full paper in PDF, 1.28MB). Takashi Kurosaki "Vulnerability of Household Consumption to Floods and Droughts in Developing Countries: Evidence from Pakistan", March 2013, CEI WP, no.2012-10. (This is a revised paper of PRIMCED DP no.8, February 2011, "Vulnerability of Household Consumption to Village-level Aggregate Shocks in a Developing Country".) (Abstract). (Full paper in PDF, 629KB). Ayako Matsuda, Takashi Kurosaki and Yasuyuki Sawada "Rainfall and Temperature Index Insurance in India: Project Documentation", February 2013, PRIMCED DP, no.34 (Abstract). (Full paper in PDF, 327KB). Yuko Mori and Takashi Kurosaki "Does Political Reservation Affect Voting Behavior? Empirical Evidence from India", January 2013, CEI WP, no.2012-9 (This is a revised paper with the same title listed as G-COE discussion paper, No.205/ PRIMCED discussion paper, No.17, September 2011). (Abstract). (Full paper in PDF, 518KB). Takashi Kurosaki "Household-level Recovery after Floods in a Developing Country: Evidence from Pakistan", CEI WP, no.2012-8, November 2012. (Abstract). (Full paper in PDF, 516KB). Takashi Kurosaki, Asit Banerji, S. N. Mishra, and A. K. Mangal "Unorganized Enterprises and Rural-Urban Migration in India: The Case of the Cycle Rickshaw Sector in Delhi" , July 2012, PRIMCED discussion paper no. 28.(Abstract). (Full paper in PDF, 452KB). Takashi Kurosaki, Humayun Khan, Mir Kalan Shah, and Muhammad Tahir "Household-level Recovery after Floods in a Developing Country: Further Evidence from Khyber Pakhtunkhwa, Pakistan" April 2012, PRIMCED discussion paper no. 27.(Abstract). (Full paper in PDF, 196KB). Takashi Kurosaki "Urban Transportation Infrastructure and Poverty Reduction: Delhi Metro's Impact on the Cycle Rickshaw Rental Market", March 2012, PRIMCED discussion paper no. 24. (Abstract). (Full paper in PDF, 229KB). Hidayat Ullah Khan, Takashi Kurosaki, and Ken Miura "The Effectiveness of Community-Based Development in Poverty Reduction: A Descriptive Analysis of a Women-Managed NGO in Rural Pakistan", September 2011, PRIMCED DP No.13/CEI DP 2011-4. (Abstract). (Full paper in PDF, 517KB). Takashi Kurosaki, Humayun Khan, Mir Kalan Shah, and Muhammad Tahir "Natural Disasters, Relief Aid, and Household Vulnerability in Pakistan: Evidence from a Pilot Survey in Khyber Pakhtunkhwa", August 2011, PRIMCED DP No.12. (Abstract). (Full paper in PDF, 366KB). Takashi Kurosaki "Wages in Kind and Economic Development: Historical and Contemporary Evidence from Asia", PRIMCED discussion paper No.11, March 2011 (Abstract). (Full paper in PDF, 391KB). Takashi Kurosaki and Hidayat Ullah Khan, "Vulnerability of Microfinance to Strategic Default and Covariate Shocks: Evidence from Pakistan", PRIMCED discussion paper No.10/CEI discussion paper No.2010-13, March 2011 (revised from the October 2009 version with the same titile) (Abstract). (Full paper in PDF, 1087KB). Takashi Kurosaki, "Compilation of Agricultural Production Data in Areas Currently in India, Pakistan, and Bangladesh from 1901/02 to 2001/02", G-COE discussion paper, No.169/ PRIMCED discussion paper, No.6, Februrary 2011. (Abstract). (Full paper in PDF, 1121KB). Yasuyuki Sawada, Hiroyuki Yamada, and Takashi Kurosaki, "Is Aid Allocation Consistent with Global Poverty Reduction? A Cross-Donor Comparison", mimeo, April 2009 (revised version of the RIETI Discussion Paper 08-E-025). (Abstract). (Full paper in PDF, 200KB). Takashi Kurosaki, "Vulnerability in Pakistan, 2001 - 2004", mimeo, March 2009. (Abstract). (Full paper in PDF, 337KB). Nobuhiko Fuwa, Seiro Ito, Kensuke Kubo, Takashi Kurosaki, and Yasuyuki Sawada, "How Does Credit Access Affect Children's Time Allocation in a Developing Country? A Case Study from Rural India", IDE DISCUSSION PAPER No. 183, January 2009. (Abstract). (Access to the full paper in PDF). Kyosuke Kurita and Takashi Kurosaki, "The Dynamics of Growth, Poverty, and Inequality: A Panel Analysis of Regional Data from the Philippines and Thailand," COE Discussion Paper no.223, Institute of Economic Research, Hitotsubashi University, Tokyo. October 2007.(Abstract). (Full paper in PDF, 837KB). Fuwa, Nobuhiko, Seiro Ito, Kensuke Kubo, Takashi Kurosaki, and Yasuyuki Sawada. "Is There a Mothers' Dilemma? : Credit Constraint, Mothers' Work and Gender Disparity in Intrahousehold Time Allocation in Rural India." Mimeo, August 2007. A completely-revised version of the paper previously titled "Intrahousehold Resource Allocation, Child Labor, and School Enrollment: Evidence from Rural India" (paper presented at the NEUDC 2006 Conference, Cornel University, September 29-30, 2006) (Abstract). (Full paper in PDF, 522KB). Kurosaki, Takashi, Yasuyuki Sawada, Asit Banerji, and S.N. Mishra "Rural-Urban Migration and Urban Poverty: Socio-Economic Profiles of Rickshaw Pullers and Owner-Contractors in North-East Delhi." COE Discussion Paper no.205, Institute of Economic Research, Hitotsubashi University, Tokyo. February 2007. (Full paper in PDF, 816KB). Kurosaki, T. "Labor Contracts, Incentives, and Food Security in Rural Myanmar", January 2005 (revised from the August 2005 and July 2005 versions). COE Discussion Paper no.134, Institute of Economic Research, Hitotsubashi University, Tokyo. (Abstract). (Full paper in PDF, 1384KB). Kurosaki, T. "Dynamics of Livelihood Structure and Assets in Village India, 1975-2004: Literature Survey and Research Agendas," February 2005. (Full paper in PDF, 658KB). Kurosaki, T., and Humayun Khan "Effects of Human Capital on Farm and Non-Farm Productivity and Occupational Stratification in Rural Pakistan", COE Discussion Paper no.46, Institute of Economic Research, Hitotsubashi University, Tokyo. November 2004. (Abstract). (Full paper in PDF, 479KB). Kurosaki, Takashi, Ikuko Okamoto, Kyosuke Kurita, and Koichi Fujita "Rich Periphery, Poor Center: Myanmar's Rural Economy under Partial Transition to a Market Economy." COE Discussion Paper no.23, Institute of Economic Research, Hitotsubashi University, Tokyo, March 2004. A revised version of the paper presented at the Northeast Universities Development Consortium Conference, Yale University, October 17-19, 2003. (Abstract). (Full paper in PDF, 521KB). Kurosaki, T. "Measurement of Chronic and Transient Poverty: Theory and Application to Pakistan", March 2003. Paper presented at an international conference, "Staying Poor: Chronic Poverty and Development Policy", University of Manchester, April 7-9, 2003 [Discussion Paper Series A No.436, Institute of Economic Research, Hitotsubashi University]. (Abstract). (Text and table of the paper in PDF, 276KB; Figures of the paper in PDF, 56KB). Kurosaki, T. and Mika Ueyama, "Micro Household Surveys and Development Microeconomics: With Special Emphasis on Child Health and Intrahousehold Resource Allocation in Sub-Saharan Africa and South Asia", In T. Sakurai, J. Furuya, and H. Takagi (eds. ), Economic Analyses of Agricultural Technologies and Rural Institutions in West Africa (proceedings of JIRCAS International Workshop 12-13 July 2001, Tsukuba, Japan, published on October 2002), pp.95-106.(Abstract). (Full paper in PDF, 57KB). Kurosaki, T. "Specialization and Diversification in Agricultural Transformation: The Case of Rural Punjab, c.1900-1995, February 2001. IER Discussion Paper Series A No. 406. (Abstract). (Text of the full paper in PDF, 244KB; Figures of the full paper in PDF, 66KB). This paper was divided into two papers listed just above. Kurosaki, T. "Human Capital and Elimination of Rural Poverty: A Case Study of the North-West Frontier Province, Pakistan", (with Humayun Khan). IER Discussion Paper Series B No. 25, Hitotsubashi University. January 2001. (Abstract). (Full paper with descriptive tables, in PDF, 274KB, Appendix Tables for Data Base, in PDF, 86KB). Kurosaki, T. "Consumption and Asset Structure in Village India 1975-84," in Economic Development and Quality of Life in South Asia, Proceedings of the International Conference on "November 27-28, 1999, at Aster Plaza, Hiroshima, Japan; Publication of Scientific Research Results No. 5, March 2000: 61-82. (Abstract). (Text of the full paper in PDF, 185KB; Figures of the full paper in PDF, 27KB). Kurosaki, T. and Anwar Hussain. "Poverty, Risk, and Human Capital in the Rural North-West Frontier Province, Pakistan." IER Discussion Paper Series B No.24, March 1999, Hitotsubashi University. (Abstract). (Full paper without tables and data appendix, in PDF, 190KB, Summary Tables in PDF, 60KB, ). Kurosaki, T. "Risk, Household Behavior, and Poverty: A Review." Mimeo. July 1996. (Abstract). Takashi Kurosaki, Risk and Household Behavior in Pakistan's Agriculture (Tokyo: Institute of Developing Economies. I.D.E. Occasional Papers Series No. 34., 1998, ISBN 4-258-52034-9 C3033, \3675, Overseas distributor=Maruzen Co.). (Abstract). Takahashi, Kazushi, Abu Shonchoy, Seiro Ito, and Takashi Kurosaki, "How Does Contract Design Affect the Uptake of Microcredit among the Ultra-poor? Experimental Evidence from River Islands of Northern Bangladesh", forthcoming in Journal of Development Studies. Kurosaki, Takashi and Hidayat Ullah Khan, "Impact of Human Resource Development Training on Crop Damages by Wild Animals in Developing Countries: Experimental Evidence from Rural Pakistan", forthcoming in Journal of Development Effectiveness. Khan, Hidayat Ullah and Takashi Kurosaki, "Targeting Performance of Community-based Development Interventions: An Econometric Analysis of a Women-Focused and Women-Managed Non-Governmental Organization in Rural Pakistan", forthcoming in Pakistan Development Review, Papers and Proceedings. Mori, Yuko and Takashi Kurosaki, "Does Political Reservation Affect Voting Behavior? Empirical Evidence from India", forthcoming in Economic and Plitical Weekly. Kurosaki, Takashi and Kazuya Wada, "Spatial Characteristics of Long-term Changes in Indian Agricultural Production: District-Level Analysis, 1965-2007", Review of Agrarian Studies, 5(1) January-June 2015: 1-38.(Abstract). Kurosaki, Takashi. "Vulnerability of Household Consumption to Floods and Droughts in Developing Countries: Evidence from Pakistan", Environment and Development Economics, vol.20, issue 2, April 2015: 209-235.(Abstract). Kurosaki, Takashi. "Long-term Agricultural Growth in India, Pakistan, and Bangladesh from 1901/2 to 2001/2", International Journal of South Asian Studies, Vol. 7, 2015: 61-86. Kurosaki, Takashi. "Dynamics of Household Assets and Income Shocks in the Long-run Process of Economic Development: The Case of Rural Pakistan" Asian Development Review, 30(2), September 2013: 76-109.(Abstract). Nobuhiko Fuwa, Seiro Ito, Kensuke Kubo, Takashi Kurosaki, and Yasuyuki Sawada "How Does Credit Access Affect Children's Time Allocation? Evidence from Rural India" Journal of Globalization and Development, 3(1), Published Online 2012-06-28.(Abstract). Takashi Kurosaki and Hidayat Ullah Khan "Vulnerability of Microfinance to Strategic Default and Covariate Shocks: Evidence from Pakistan", Developing Economies, 50(2) June 2012: 81-115.(Abstract). Takashi Kurosaki and Humayun Khan "Floods, Relief Aid, and Household Resilience in Rural Pakistan: Findings from a Pilot Survey in Khyber Pakhtunkhwa", The Review of Agrarian Studies, 1(2) July-December 2011: 79-107.(Abstract). Kyosuke Kurita and Takashi Kurosaki, "The Dynamics of Growth, Poverty, and Inequality: A Panel Analysis of Regional Data from the Philippines and Thailand", Asian Economic Journal 25(1) March 2011: 3-33. (Abstract). (Working paper version in PDF, 265KB). Takashi Kurosaki "Targeting the Vulnerable and the Choice of Vulnerability Measures: Review and Application to Pakistan", Pakistan Development Review 49(2) Summer 2010: 87-103. (Abstract). (Working paper version in PDF, 230KB). Takahiro Ito and Takashi Kurosaki, "Weather Risk, Wages in Kind, and the Off-Farm Labor Supply of Agricultural Households in a Developing Country," American Journal of Agricultural Economics 91(3) August 2009: 697-710.(Abstract). (Working paper version in PDF, 391KB; Appendix in PDF, 564KB). Kurosaki, T. "Crop Choice, Farm Income, and Political Control in Myanmar", Journal of the Asia Pacific Economy 13(2) May 2008: 180-203.(Abstract). Kurosaki, T. "Comment on 'Economic Reforms and Human Development Indicators in India'", Asian Economic Policy Review, Volume 3 Issue 2 (December 2008): 313-314. (Link to the journal's special issue on "New India"). Kurosaki, T. "The Measurement of Transient Poverty: Theory and Application to Pakistan", Journal of Economic Inequality. Volume 4, Issue 3 (December 2006): 325-345. (Abstract). Fuwa, Nobuhiko, Seiro Ito, Kensuke Kubo, Takashi Kurosaki, and Yasuyuki Sawada. "Introduction to A Study of Intrahousehold Resource Allocation and Gender Discrimination in Rural Andhra Pradesh, India." Developing Economies 44(4) December 2006: 375-97. Fuwa, Nobuhiko, Seiro Ito, Kensuke Kubo, Takashi Kurosaki, and Yasuyuki Sawada. "Gender Discrimination, Intrahousehold Resource Allocation, and Importance of Spouses' Fathers: Evidence on Household Expenditure from Rural India." Developing Economies 44(4) December 2006: 398-439. (Abstract). Takashi Kurosaki, Seiro Ito, Nobuhiko Fuwa, Kensuke Kubo, and Yasuyuki Sawada. "Child Labor and School Enrollment in Rural India: Whose Education Matters?" Developing Economies 44(4) December 2006: 440-464. (Abstract). Yasuyuki Sawada, Kensuke Kubo, Nobuhiko Fuwa, Seiro Ito, and Takashi Kurosaki. "On the Mother and Child Labor Nexus under Credit Constraints: Findings from Rural India." Developing Economies 44(4) December 2006: 465-499. (Abstract). Kurosaki, T. "Long-term Agricultural Growth and Crop Shifts in India and Pakistan", Journal of International Economic Studies (the Institute of Comparative Economic Studies, Hosei University), No.20, March 2006: 19-35. (Abstract). Kurosaki, T., and Humayun Khan "Human Capital, Productivity, and Stratefication in Rural Pakistan", Review of Development Economics, 10(1) February 2006: 116-134. (Abstract). Kurosaki, T. "Consumption Vulnerability to Risk in Rural Pakistan", Journal of Development Studies, 42(1) January 2006: 70-89. (Abstract). Kurosaki, T. "Specialization and Diversification in Agricultural Transformation: The Case of West Punjab, 1903-1992", American Journal of Agricultural Economics , May 2003, Vol.85, No.2: 373-387.(Abstract). Kurosaki, T. "Agriculture in India and Pakistan, 1900-95: A Further Note", Economic and Political Weekly. July 27, 2002 (Vol.37, no.30): 3149-3152. (Abstract). (Full paper in PDF, 143KB). Kurosaki, T. and Marcel Fafchamps, "Insurance Market Efficiency and Crop Choices in Pakistan", Journal of Development Economics, 67(2), April 2002: 419-453. (Abstract). (Full paper in PDF, 327KB). Kurosaki, T. "Agriculture in India and Pakistan, 1900-95: Productivity and Crop Mix." Economic and Political Weekly (India), 34(52) December 25, 1999: A160-A168. (Abstract). 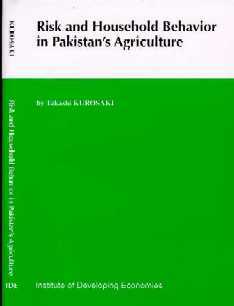 Kurosaki, T. "Production Risk and Advantages of Mixed Farming in the Pakistan Punjab." Developing Economies. 35(1), March 1997: 28-47. (Abstract). Kurosaki, T. "Milk, Fodder, and the Green Revolution: The Case of Mixed Farming in the Pakistan Punjab." Pakistan Development Review. 35(4) Part II, Winter 1996: 537-548. (Abstract). Kurosaki, T. "Government Interventions, Market Integration, and Price Risk in Pakistan's Punjab." Pakistan Development Review. 35(2), Summer 1996: 129-144. (Abstract). Kurosaki, T. "Risk and Insurance in a Household Economy: Role of Livestock in Mixed Farming in Pakistan." Developing Economies. 33(4), December 1995: 464-485. (Abstract). Kurosaki, Takashi "Experimental Design for Flexible Microcredit Trials", in Abu Shonchoy ed., Seasonality and Microcredit: The Case of Northern Bangladesh, Springer Briefs in Economics, Tokyo: Springer Japan, pp.55-70. Kurosaki, Takashi "Impact of Flexible Microcredit on Food Consumption", in Abu Shonchoy ed., Seasonality and Microcredit: The Case of Northern Bangladesh, Springer Briefs in Economics, Tokyo: Springer Japan, pp.91-104. Takashi Kurosaki, "Studies in Japan on the Rural Economy of Pakistan," Social Science and Policy Bulletin (Lahore University of Management Sciences), Volume 4, no.1, Summer 2012: 17-23. (Its manuscript version in PDF, 406KB). Takashi Kurosaki, "Economic Inequality in South Asia", Routledge Handbook of South Asian Economics, edited by Raghbendra Jha, 2011 (ISBN 978-0-415-55397-1), pp.61-75. (Its manuscript version in PDF, 208KB). Yuko Mori and Takashi Kurosaki, "Does Political Reservation Affect Voter Turnout?" Hindu, May 06, 2011. (Its manuscript version in PDF, 30KB). Kurosaki, T. "Land-Use Changes and Agricultural Growth in India, Pakistan, and Bangladesh, 1901-2004" in Bhaskar Dutta, Tridip Ray, and E. Somanathan (eds.) New and Enduring Themes in Development Economics, Chennai/Singapore: World Scientific Publishing, pp.303-330, 2009 (ISBN: 978-981-283-941-1). (Revised version of the paper presented at the International Conference on Comparative Development, Indian Statistical Institute, New Delhi, 18-20 December, 2007). (Abstract). (Working paper version in PDF, 203KB). Kurosaki, T. "Poverty Reduction, Rural Markets, and Human Capital" Proceedings, JIRCAS International Syposium 2009: Roles of Social Sciences in International Agricultural Research and Development, November 4-5, 2009. Tsukuba JIRCAS:24-29. Kurosaki, T. "Land-use Changes and Agricultural Growth in India and Pakistan, 1901-2004" in Andrew Millington and Wendy Jepson (eds. ), Land Change Science in the Tropics: Changing Agricultural Landscapes, New York: Springer (ISBN: 978-0-387-78863-0). 2008, pp.53-72.(Abstract). (Link to the publisher). Kurosaki, T. "Intrahousehold Resource Allocation and Gender Discrimination in Andhra Pradesh, India" in A Comparative Study of the Research Conditions of Women Scientists, Gender Isasues in S&T, and the Present Conditions of Women's/Gender Studies in Asian Countries towards Human Centered Sustainable Development, compiled by Hiroko Hara. Science Council of Asia (SCA). SCA Report March 2008. pp.103-108. Kurosaki, T. "Poverty in Pakistan and Community Development" Presentation at JICA (DSP) Seminar Series I "Community Development and Local Government," Lahore, Pakistan. September 17, 2004. (Abstract in PDF, 30KB). Kurosaki, T. "Wage Statistics and Rural Labor Markets in Developing Countries", Hi-Stat Newsletter, No.1, 2004.4: 3-5. Kurosaki, T. "Poverty, Human Capital and Household-Level Diversification in the North-West Frontier Province, Pakistan", In S.S. Acharya, Surjit Singh, and Vidya Sagar (eds. ), Sustainable Agriculture, Poverty and Food Security, Jaipur, India: Rawat Publications, 2002, pp.607-639. Kurosaki, T. "Pakistan: Border Changes and National Income Statistics." Newsletter of the Asian Historical Statistics Project. No.6, July 1997: 8-10. (full paper).